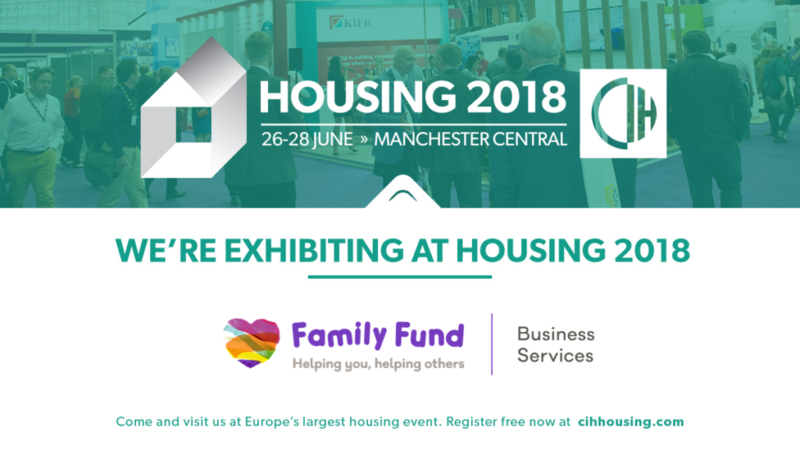 Family Fund Business Services will be exhibiting at the upcoming Housing 2018 on the 26th, 27th and 28th June at Manchester Central. Housing 2018 is Europe’s largest Housing Event and for over 60 years the Chartered Institute of Housing’s annual conference and exhibition has been the place to meet the largest and most diverse audience of sector professionals. The three-day event includes an exceptional programme boasting leading minds in the sector, who will deliver debates, masterclasses and Q&As to help delegates discover, learn and shape the future of the housing sector together. The conference will also host hundreds of exhibitors including Family Fund Business Services, proudly showcasing our innovative and unique procurement model on stand C64. Family Fund Business Services (FFBS) is the UK’s leading fulfilment service, with over 45 years of grant administration expertise developed by our parent charity, Family Fund. FFBS launched its services into the housing sector last year and are now building partnerships with Housing Associations across the UK, helping them to save time and money procuring goods and fitting out their properties. If you or any of your colleagues will be attending the conference and would like to meet with us for a brief chat about how we help local authorities, housing associations, other grant making charities and benevolent organisations, please contact Simon Haddock, so we can arrange to meet on the day. Alternatively, contact us directly and we will arrange to meet with you at your convenience. Come along and be part of this unforgettable two day event; we hope to see you there! This entry was posted in Events, Housing, Partnerships and tagged Conference, Event, Exhibition, Fulfilment Service, Housing 18, Housing Associations, Manchester, Procurement. Bookmark the permalink.